i would download this right now, but i'm at a library... now i have something to look forward to though when i get home!! thanks for the release. More Aria love. Thanks for the Release. One of my favourite eps. Heck, they're all good. thanks a lot for the release. But I did think, "What, Aika, you only realised that now?" Now I'm wondering, what will you do Mr. Mez, Basaka, Randomougi, Stagione, Grimah, X10A, Greenneutron, Sticks, Kayin, and Meepers if you reach the end of ARIA? Will you only translate Amanchu? Or is there anything else? The two Kozue Amano Tanpenshuu volumes would be interesting. One has a short spaceship story, which appears to explain the origin and nature of Caith Sith. 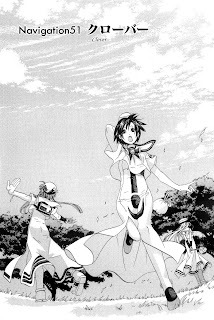 Someone is slowly scanlating the earlier Crescent Noise manga, although that one is nothing like Aria. (When) we finish ARIA, at least I'll be taking a break (which means nothing will be done) - apart from maybe the monthly Amanchu's. The only FUTURE possibilities, MIGHT be the Montly Undines or the two earlier Amano works (which we've been offered HQ raws for already). The monthlies have shorts in them, though whether they're all translated or not I have no idea. This chapter has been very faithfully adapted into the the anime... and with good reason. Of course, the age difference between Akira and young Aika is way too big to make any sense, but it's a cute story nevertheless. I'm already trying to translate the text heavy parts of the 1st monthly undine, but the magazine-level vocabulary and the lack of furingana makes the job very hard and slow. It takes 1h+ for a single page, so I'm probably going to drop it sometime soon. I'd gladly translate Roman Club and other early works though. One possible approach to Mensile Undine could be to computer scan and OCR the pages with a japanese capable recognition software, like the newer editions of Abbyy FineReader. Thanks, I'm going to give Abbyy a try. I once did try to search for OCR software that worked with japanese but I didn't find any. I think you need at least Abbyy FineReader 9 or Abbyy FotoReader for chinese-japanese support, the older editions do not support these complicated languages.